Fast off its Canada release (details here), BLACKBURN is now getting set to release across the U.S.A.
Director Lauro Chartrand and writer Nastasha Baron’s BLACKBURN has already released within the United Kingdom (details here), this past September. The film also saw Canadian markets in December, via Raven Banner Entertainment. Now, the film is available in the United States, with Tombstone Distribution, a subdivision of Archstone. 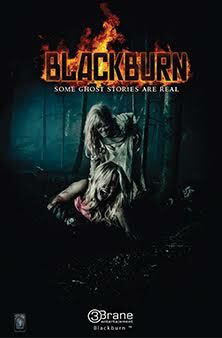 Blackburn has just released on various Video-on-demand platforms. This 3Brane Entertainment production involves a group of friends, in a remote Alaskan town. A forest fire and rockslide force the friends into an old asylum. Within, Jade (Sarah Lind), Shaun (Zack Peladeau), Chelsea (Emilie Ullerup), Ryan (Calum Worthy) and Luke (Alexander Calvert) find that the asylum never fully closed down. Now, they must fight with the deformed creatures within, if they hope to survive the night. BLACKBURN is now or will be shortly available on at least seven VOD platforms. Currently on Amazon, the film is also soon to be available on: iTunes, Google Play, VuDu, the Playstation Network and many more. A US DVD release, for the film, is still in the works and more details will be made available soon. For now, horror fans can step inside one of the most deadly locations, with BLACKBURN - out now!